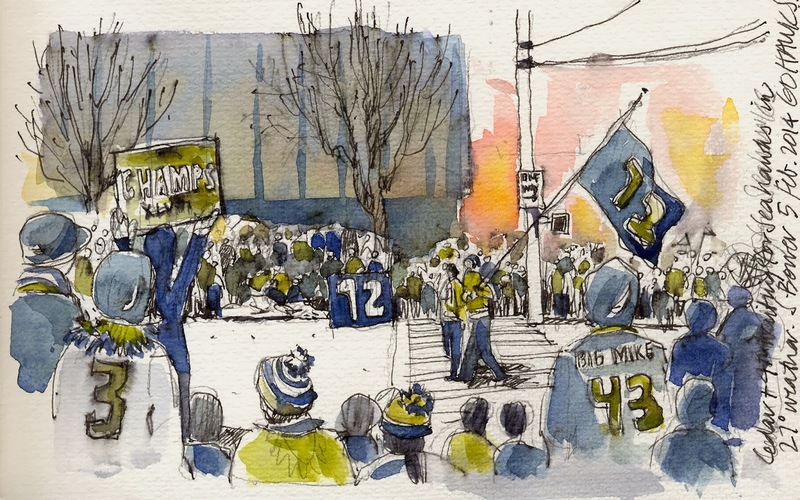 Urban Sketchers Seattle: GO HAWKS! Sub-freezing temps, an unbelievable number of people (was it 700,000 or a million??!!) filling the streets and showing 12th man love for our team. What a day!!! This was sketched while we waited for the parade to start, before there was a layer 15 people deep in front of us. I don't know how the parade made it through, there were so many people. Not my best sketch, and it turns out the ink is NOT permanent--darn--so I painted a lot of mud while the sketch disappeared...reminds me why I usually draw in pencil! Ah well, it was great to be there today, and this sketch will help me remember the event and the cold. I look forward to seeing everyone's sketches of this memorable day! "Why not us" indeed?! Nice sketch Stephanie, how long were you out there? although I must admit it was pretty fun. I was out there probably about 4-5 hours, mostly in the shade of the buildings, so it was COLD!! The street in the sketch eventually filled with people. You are a brave woman Stephanie Bower. Love this sketch and I can feel the cold. Brrrrr. After my eye appointment, I got home in time to watch all the festivities unfold on TV. Love this sketch..full of energy and "beast mode"! We stood on the west side of 4th and Pine by Westlake tunnel for several hours. Sketching was challenging!